As we enter Olympic year, which are the strongest – and weakest – track and field events in the UK? 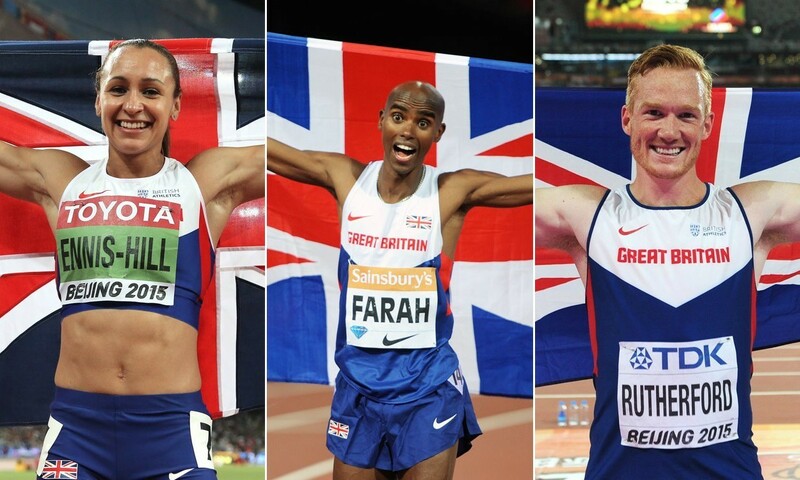 The number of British athletes ranked in the top 10 of the world rankings is on the rise. From 13 athletes in 2013 and 2014, the figure has risen to 14 during 2015 – an encouraging statistic as Team GB begins its countdown to Rio at the start of 2016. When it comes to No.1 world merit ranking positions, heptathlete Katarina Johnson-Thompson was the only Briton who managed this feat in 2014, but in 2015 Jessica Ennis-Hill (heptathlon), Mo Farah (5000m and 10,000m) and Greg Rutherford (long jump) are all top of the global lists. These statistics and much more are included in Athletics Weekly’s ‘stats special’ which is out on December 31. 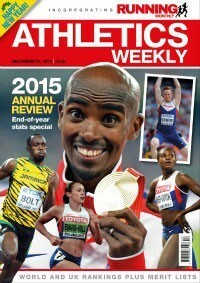 This end-of-year review has been produced in association with Peter Matthews and Mel Watman of Athletics International, the popular subscription-only news and results e-zine, with their expertise and knowledge best illustrated in the compilation of their merit rankings, where pure performances are mixed with major event placings and win-loss records against rivals to produce the definitive list of top athletes both in Britain and internationally. Farah, for example, is only the second fastest Briton over 5000m in 2015 behind Tom Farrell and only 31st quickest in the world, but his various victories, most notably the world title in Beijing, makes him a clear world No.1 on the merit rankings. Apart from the aforementioned names, Shara Proctor ranks No.2 on the world merit rankings behind Tianna Bartoletta of the United States, while Lynsey Sharp is fourth in the 800m lists and Lorraine Ugen (long jump), Tiffany Porter (100m hurdles) and Zharnel Hughes (200m) are No.5 in their respective events. So which are the strongest and weakest events in British athletics? With both men’s and women’s sprints in great shape, it’s no surprise British Athletics puts so much emphasis on the medal-winning chances of relay teams. The 50th best performance on the UK men’s 100m rankings of 10.55 was a record, as was the 50th best in the UK men’s 200m lists of 21.38. With UK record-breaker Dina Asher-Smith setting the pace, the women’s sprints are similarly vibrant with the 50th best marks on the UK 100m and 200m rankings of 11.97 and 24.43 being record bests. Over 400m, the 10th fastest men’s mark of 45.90 is a record for British athletics, while the 50th quickest women’s 400m performance of 55.16 is also the best ever. Behind the multiple world and Olympic champion, the depth of men’s distance running in the UK continues to struggle. In the 5000m, 24 men ran under 14 minutes in 2015 compared to 112 in 1985, although 61 men under 14:20 is the most since 1995. In the marathon, there is a similar picture with 39 men breaking 2:25 in 2015 compared to 229 in 1983 but the 50th best of 2:25:55 is again the best since 1995. The women’s endurance running scene is brighter with Sharp and Laura Muir leading the way, while a record 130 British women broke three hours for the marathon. UK record-breaker Nick Miller is leading a renaissance in the men’s hammer and 25 men over 60 metres is an event record. The 100m hurdles and long jump for women have a number of potential Olympic finalists with a record five long jumpers over 6.70m and five sprint hurdlers quicker than 12.87. For so long one of British athletics’ Cinderella events, the women’s high jump saw senior and junior UK records indoors and outdoors in 2015. Not surprisingly, relatively new events like women’s pole vault continue to flourish as well. Despite boasting talents such as Ennis-Hill, Johnson-Thompson and Morgan Lake, only 20 performances over 5000 points for the heptathlon in 2015 was the lowest since scoring tables were changed in 1992 (the record high is 51 from 1993). Christine Ohuruogu has run the fastest 400m for the 12th year on the trot – a record for any track event by a British woman. Farah tops the UK 5000m merit rankings for the 11th year and the 10,000m for the seventh time in eight years. Rutherford ranks No.1 in long jump for the seventh time, Jo Atkinson leads the women’s walks rankings for the 10th time, while Goldie Sayers was No.1 in the women’s javelin for the 12th time despite only competing three times in 2015. It is hard to read the 2015 ranking lists without rueing the number of instances where British athletes were denied competition at major championships. This ranges from Andy Vernon’s and Lennie Waite’s non-inclusion in the GB team for the World Championships in Beijing to the omission of potential medal-winning sprinters from the European Under-23 Championships – decisions which frustrated athletes and coaches and infuriated travelling fans. With the exception of the hammer, the men’s throws are in particularly poor condition. The best throw by a British javelin thrower was almost two metres behind the previous worst of the new javelin era, although the event was hit by injuries to athletes like Lee Doran. The men’s shot put saw the worst top-ranked throw by a Briton since 1987 (a mark that placed about 200th on the world rankings). Men’s discus is similarly poor with the 50th best mark being the worst since 1977. Women’s throws are healthier, with Rachel Wallader, for example, producing the best shot put performance by a Briton for 15 years. In the men’s 3000m steeplechase, no one broke 8:30 in 2015 and the 10th best mark of 8:57.34 is the fourth worst in the past half century (only 2007-09 were worse). Tom Bosworth and Dominic King are working hard to keep men’s race walks standards respectable and Bosworth set UK records at 5000m and 10km in 2015, but just two men under 1:40 for 20km is easily the worst ever and compares to 59 in 1977 and 1983. All of which raises the question, should British Athletics plough money and resources into events that are more likely to lead to international success? Or should they divert more attention to struggling events?